Stone Cottage017684 82647work017684 82836fax Self-cateringEnjoyEngland gold award 2008, England's Northwest award winner and Cumbria Tourism award winner 2007, self catering holiday of the year. Stone Cottage offers weekly bookings starting on Friday and sometimes short breaks. EnjoyEngland gold award 2008, England's Northwest award winner and Cumbria Tourism award winner 2007, self catering holiday of the year. A luxuriously renovated, character house in the tiny hamlet of Deepdale. A painstaking refurbishment programme has exposed and breathed life into many original features creating a chic cottage which feels at home in its glorious Lakeland setting. Farrow and Ball paints and fabrics from Liberty and Osborne and Little, complement the finest local materials and artists works. 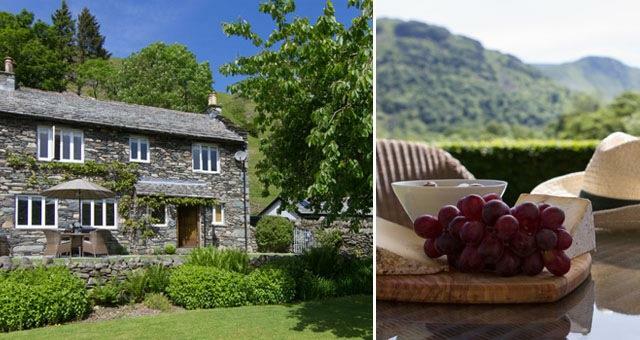 Feel at home and unwind in the understated luxury of this spacious cottage for 6. The accommodation includes a large beamed sitting room with sumptuous velvet sofas and roaring log fire and magnificent views, separate dining room, architect designed kitchen, 2 smart contemporary bathrooms. All 4 bedrooms, 2 Kings and 2 singles, are individually designed and have lovely views. All inclusive tariff. Local produce can be provided and fridge/freezer stocked on arrival. Private, enclosed garden with wonderful views. Cot, high chair, baby bath,changing mat, bed rail can all be provided free of charge on request. 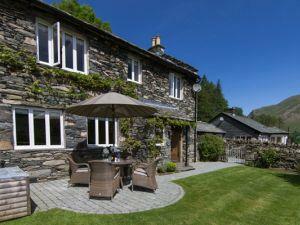 Located just 1 mile from Patterdale and 2 miles from Glenridding with a choice of pubs, hotel bars and cafes. Steamers on Ullswater depart from Glenridding where a range of watersports is available. Horse-riding, bicycle hire can all be arranged locally. Fantastic walking country, Helvellyn can be tackled from the door. Non-smoking establishment. Children welcome from any age. The house is set back 0.25 mile to the western side of the Kirkstone Pass Road, A592, at Deepdale Bridge, 1 mile south of Patterdale. Approximately 21 miles north from M6 junction 36, Kendal exit and 18 miles south from junction 40, Penrith.